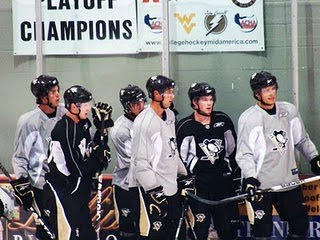 The Pens’ Rookie Camp started Tuesday afternoon in front of a decent crowd at Southpointe. A handful of defensemen were the first to appear on the ice for a power skating session with Marianne Watkins. Alex Grant was the stand out of the group. The kid nailed every drill they did and his footwork wasn‘t too bad either. Meanwhile, coach Meloche had Brad Thiessen and Patrick Killeen doing a few drills. Playing the puck behind the net was a big one and both net minders did very well. 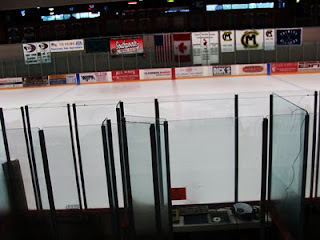 After about 25 minutes, the guys went back into the locker room to allow the zamboni to clean the ice for the rest of the rest of the evening. As soon as the zamboni made its final pass, the rest of the rookies stepped out onto the ice. After some skating drills, we finally got some pucks on the ice. If you’ve never seen Zach Sill take a slap shot, you should. Sill was the most impressive when it came to taking a shot on Tuesday. Coach Reirden then instructed some 2-on-1 drills. The defensemen who were impressive in the 2-on-1 drills were Brian Strait, Simon Despres, and Alex Grant. Straiter was very quick on his feet, the fastest I’ve seen him. He looked very comfortable in what he was doing, not tense at all. He worked well with cutting off any passes. Simon Despres is a big man, though he was using his body, I’d like to see him use it more. He did a fairly decent job of working his man off the puck. Alex Grant was the smoothest skating dman at camp on Tuesday. He had great stick work as well, poking the puck off the forwards stick. The forwards who were impressive in the 2-on-1 drills were Nick Peterson, Zach Sill, Joey Haddad. When watching rookies practice you tend to notice sometime they change they way they skate when handling the puck, but that wasn’t the case with Nick Peterson. Nick managed the puck very well when it was his turn to take it down ice. Zach Sill has been outstanding at camp. A heavy wrister, that at times, you almost felt bad for Thiessen and Killeen having to stop them. Joey Haddad has been the surprise at camp, in my opinion. I got the chance to watch him play in Wilkes Barre this past season and he has much improved. His foot work has gotten better, not to mention a wicked shot. Next came the shootout, the White team versus the Black team, if all the players on either team scored, that team got the point for the day. Despres won it for the Black with a nice little drag to roof the puck on Killeen. No, I didn’t forget about the netminders. Killeen and Thiessen have both looked very sharp. Brad especially has been quick with the glove, a few stops were stunning. Coach Meloche has been really working with these guys and it’s showing for sure. Brad Thiessen had a scary moment during a drill when winger Alex Smigelski slapped a heavy shot that hit Thiessen under the mask in the side of the neck. Brad was down for a few minutes but was okay and finished practice, strong might I add. All and all a great first day for the Rookies. No rest for the weary come day 2. Though Ekbom, Modig, D’Agostino and Bathgate were not dressed. Marianne Watkins had a handful of forwards today in a power skate session. The forwards learned a couple techniques on how to improve their acceleration from a stand still position. Meanwhile the net minders were working on front net presence, posting up and stacking the pads. 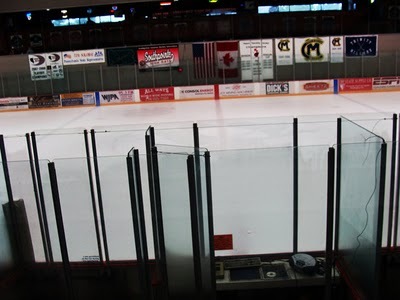 We get our Zamboni “intermission” before the rest of the guys make their way onto the ice. At this point in the practice the rookies get a chance to loosen up their wrists and take some shots as they skate around. It didn’t take long for Alex Smigelski to show off his wrister. The kid is literally a spitfire, very aggressive to the puck, throws a decent check and doesn’t hold back on his shot. Coach Reirden then barks out orders for 2-on-1 drills. Throughout the 2 days I’ve been at camp the defensemen have been impressive and they didn’t let me down on this drill. Out of the dmen, Grant, Strait, Roglaski were the most consistent. Rogalski, the Pens’ 6th round draft pick, looked much more comfortable out on the ice Wednesday. He kept better communication with his fellow defensemen as well. It seemed that Thiessen and Killeen hadn’t skipped a beat since day 1, flashing the glove from time to time. 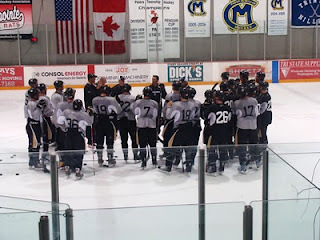 Afterwards Coach Bylsma took the forwards and Coach Reirden and Fitzy took the defensemen. The dmen worked on neutral zone passing as well as one timers from the blueline. Brady Lamb stood out the most when it came to the shot from the blueline though Grant and Despres weren’t very far behind. Grant also showed off his stellar skating during the neutral zone drill. DB had the forwards working on the down low cycle. Thiessen was put to the test first going up against the front net presence of the forwards and he stood tall. The goalies switch ends of the ice, now Killeen gets the front net presence and Thiessen gets the slappers from the blueline. Beau Bennett gets a chance to show Pat Killeen he is quite handsy and much to the crowds delight, scores a very pretty goal going top shelf. Right off the bat we see Bennett and Tangradi working hard against the boards. Though Tangradi is considerably larger than Bennett, Beau held his ground. Nick Peterson steps in for the white team, but Thiessen makes a nice stop on him, it’s not 2 seconds later that the Black team go up by a goal off the nice work of Kevin Veilluex, it was surely a garbage goal but he’ll take it. Nice work by Smigelski to get the puck down low to Veilleux. The Haddad line gets their chance for the White team but Velischek shut them down. Haddad and Velischek both gave their fair share of hard check to each other. Great work by both players. Velischek is a little undersized but his physical presence makes up for it. Simon Despres catches Thiessen snoozing and ties up the game, but it didn’t take long for Ben Hanowksi to go top shelf on Killeen to win the game for the Black team. Reid McNeill went hard in to the net and ended up having his ankle rolled up on. He seemed to be okay after he was able to get up and skate it off. After Camp on I was able to speak with a few a the guys regarding on how they thought the first 2 days of camp have gone for them. Check out some video Sam and our friend Kayla took of the 3-on-3 scrimmage. In this video you get to see Thiessen's nice glove save and Haddad and Velischek going at it. This video is about 5 minutes long and gives you an idea on how hard these rookies are actually working.